If you’re a Filipino and you believe in freedom and democracy, you should be troubled by what the military, police, and the regime are saying about the more than 10 colleges and universities supposedly becoming hotbeds of communism. The school administrators have answered the military and police. They have correctly said they are in the business of molding young minds, not recruiting communists. Screenings of films about martial law and welcoming the Lumads cannot possibly qualify as communist recruitment, said a university chancellor. And so the school administrators, senators, and party leaders have all denied the officials’ claims about their supposed involvement in a communist conspiracy. But the really right answer is, what if there are leftists and communists in schools? What if leftists and communists participate in Philippine politics? Is there anything wrong with Filipinos believing in progressive and revolutionary politics and doing it openly and legally? The answer is no, because the Philippines stands for freedom of belief and aspires for the active participation of people from all backgrounds. Is there something wrong with a La Sallian, Atenean, or a Thomasian student advocating genuine agrarian reform or national industrialization? The answer is no, and it is troubling that the military and police publicly view and smear the leftists and communists as enemies. We must reject this because leftists and communists are Filipinos too. We must be bothered by the Red scare and anti-communist hysteria. They use these tired, outdated tactics to push a narrative that standing up and rebelling against the Marcos dictatorship was wrong. And consequently, that fighting and thwarting a new dictatorship under Duterte would be wrong. They preach that being a leftist or communist is unFilipino or anti-Filipino. Our pantheon of heroes would be incomplete without the Filipino socialists and communists who formed Hukbalahap and led the guerrilla war against the Japanese. Prior to that, leftists, socialists and communists launched mass struggles to demand independence from the US, to denounce the oligarchy, to demand protection of workers, to support universal suffrage, and so on. We owe our current idea of liberal education in UP and other universities to the alliance of liberals and leftists in the 1950s when they protested and thwarted the witch-hunt against suspected communists. And earlier, patriots demanded an end to Spanish language education, in favor of the Filipino language. It was true then, and it is true now: Freedom of thought is too sacred for self-serving authorities to determine its limits and boundaries. The Bantayog ng mga Bayani would also be incomplete without the many leftists, socialists, and communists who took up the fight against the Marcos dictatorship. And if we are not troubled by the claims of the military and police, all those who joined the resistance would be shamed and then erased in the collective memory. All of them. 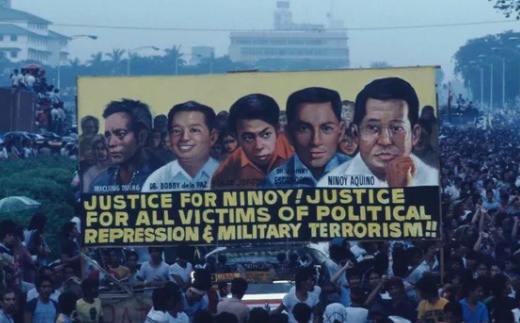 The whitewashing continues because of the Duterte regime’s historical revisionism and alliance with the Marcoses who seek full political restoration. And lest we forget, both the Armed Forces of the Philippines and the Philippine National Police have neither acknowledged nor repented their leading roles as enablers of the Marcos dictatorship. This new wave of anti-communist hysteria is not new. Such propaganda poisoned schools and society in the 1950s, leading to witch hunts. Under the Marcos dictatorship and post-EDSA regimes, anti-communist hysteria prepared public opinion to massive violations of human rights and freedoms of suspected communists or communist sympathizers — without a shred of evidence that they were were doing anything illegal. It is now 2018. We should not fall prey to the outdated and historicalrevisionist Red scare of the regime, military and police. Rabid anti-leftism and anti-communism is deeply embedded in our colonial education and colonial history. It is a challenge for liberals, democrats, conservatives, and independentminded Filipinos to shake off these false ideas, and not enable Duterte in his self-serving and self-preserving attempt at Red scare. I’m pretty sure many of us have seen leftists and communists, and could be actually friends with them. We’ve marched with them against Duterte’s granting of a hero’s burial to the dictator. We’ve rallied with them against extrajudicial killings. We’ve bewailed their removal as House committee chairs for voting against the death penalty. We’ve expressed support for peace negotiations aimed at addressing the roots of the armed conflict. We’ve joined with them in protesting the new and higher taxes under TRAIN. We’ve marvelled at the historic Labor Unity actions of 2018. We’ve crossed arms with them in defense of the Lumads, and in support of striking workers. We’ve stood alongside them for the cause of judicial independence. We’ve united with them in the United People’s SONA, and in the United People’s Action. Yes, folks: Reds care for the country we all love. They also care because they’re Filipinos too — a matter which the tyrant and his minions would want us to deny and to forget. The real enemy is not the movement whose adherents have tirelessly brought the people’s demands to Mendiola Bridge. Filipinos regardless of age, color, region, educational attainment, favorite color, voting record, creed or belief should seize the absolute honor of fighting together against the real enemy at the other side of the bridge. First published in Manila Bulletin, 6 Oct. 2018 issue.